I don't think my mom ever bought Shake and Bake. In fact, I don't think she ever made fried (or baked) chicken. When we wanted fried chicken, we bought it at KFC like God intended. But that dosn't mean I wasn't fascinated with the commercials. The little kids..."Shake and Bake...and Ah helped!" And of course this classic from Ann B. Davis. As the comments point out she drops two "Brady Bunch" references -- mentioning "9 chicken experts" and then using the word "bunch." 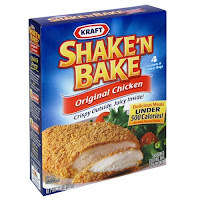 Did you have Shake and Bake as a kid? Did you "haalhp"?